It's upon us-- flu season! The past few weeks students have been dropping like flies, falling victim to the illness. Here are some tips to combat the flu or what to do if you’ve already got it. This is honestly the most foolproof way to avoid catching any sickness. I’ve gotten into the habit where I wash my hands before and after I eat, when I get home, and after leaving classrooms. Germs are everywhere, so keep them from spreading! These three things will help boost your body’s immunity and make it harder for the flu virus to attack you. If you know someone has the flu, cancel your plans to hang out until they are feeling better. A coffee date is not worth the sickness. Doctors and medicine are your friends in this situation. Student Health is a perfect resource for all of your health related concerns. They will do all they can to help you for little to no fee. Stay home, miss class, sleep! Someone will take notes for you, and I can guarantee that you will feel much better after sleeping. Sometimes people feel too sick to get out of bed. It is still important to eat and drink lots of water though. A can of soup and some saltine crackers could do the trick. I hope you all are still healthy and happy! 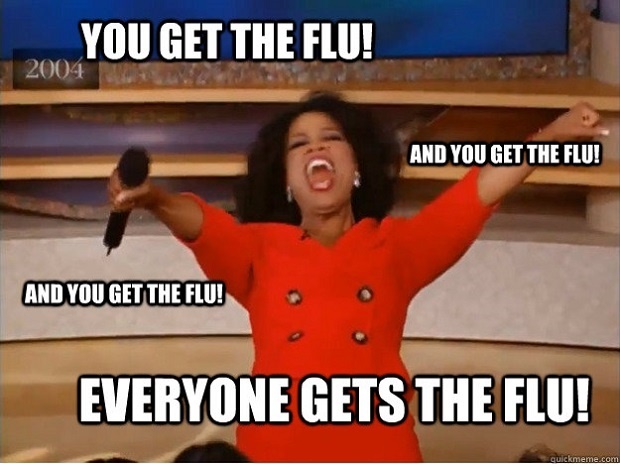 Let’s kick flu season to the curb, Pokes!